As last year, just click on the image to the left to be taken to the A-Z website and links to other blogs taking part. Good luck to everyone and I hope the inspiration keeps flowing. These lovely ladies are part of the Norse pantheon, both loved and feared by those big hairy Vikings. 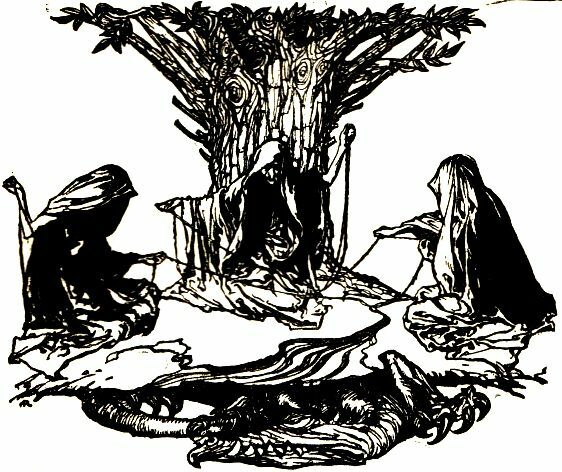 The three most important Norns were Urðr), Verðandi and Skuld, who functioned as minders of Yggdrasil, the World Tree, and prevented his roots from rotting, but other Norns governed the fate of mankind, turning up at births and deaths and determining what happened in between. 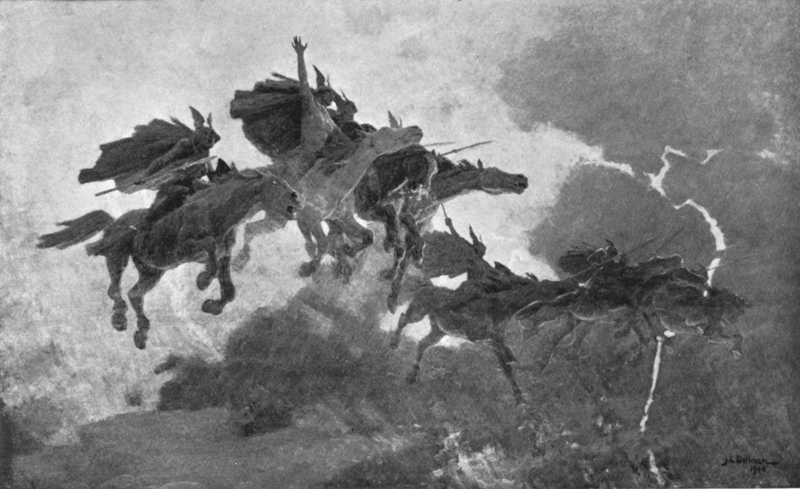 The Valkyries were a separate branch of the Norns, responsible for harvesting the souls of the most valiant amongst the recently slain. Other norns fulfilled the same function as Morai did in Greek mythology, spinning the thread of a man’s life and deciding when it should be cut short. Although it’s possible that the idea of these spinning females had cross-pollinated from the Mediterranean to the chilly North, I prefer to think that warriors all over the place looked at the complexities of weaving and thought, rather uneasily, that women might be a bit more clever than they ususally gave them credit for. Tomorrow – actually I have no idea what to write about tomorrow so it’ll be a nice surprise for me too. One of the most hostile environments in the word, and therefore of endless fascination for the types for whom anything impossible is a challenge. 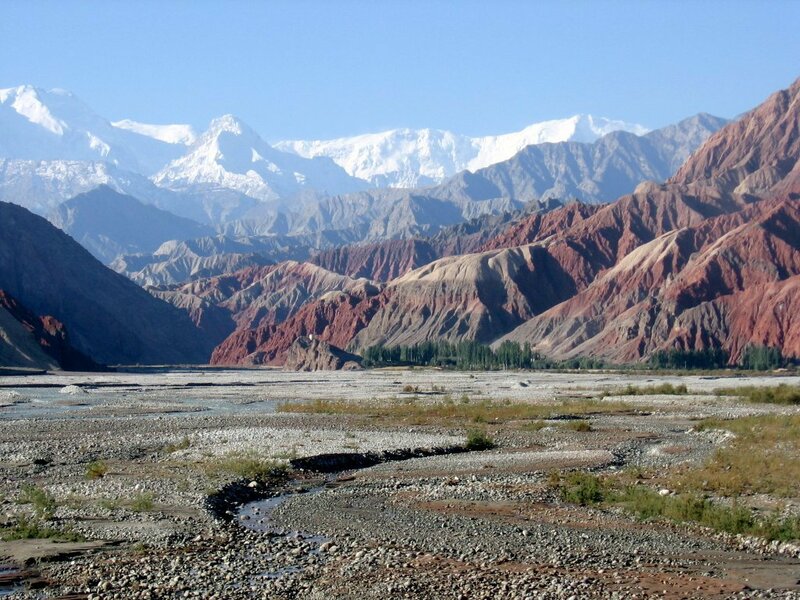 The Karakoram is part of the huge range of mountains that extends from Afghanistan in the West to China. Everest is the highest mountain in that range but the Karakorum has the highest concentration of mountains over seven thousand metres. 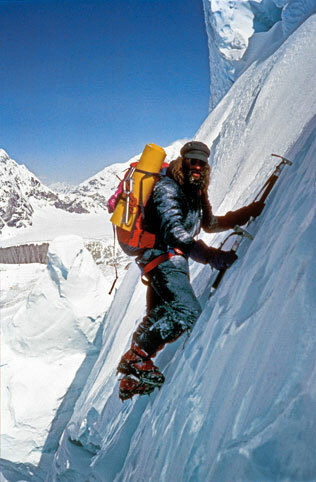 My other half was a climber in his youth, and a big fan of the extreme climbers who tackled the highest peaks. We have a shelf full of biographies of the climbers and accounts of great climbs. So when I was trying to think of a K post, Karakoram popped into my mind and I decided to talk about The Ogre – that’s the really tall spiky bit in the next picture. It’s proper name is Braintha Brakk. The highest point is 7,285 metres (23,901 ft) above sea level, so it’s a good bit shorter than Everest, but is considered to be the most difficult climb in the world. It wasn’t climbed until 1977 when a team led by Chris Bonnington comprising Doug Scott, Mo Anthoine, Clive Rowland, Nick Estcourt, and Tut Braithwaite, scaled it by the easiest possible route, which was still a terrible effort. Early on in the climb Braithwaite was caught in a rock fall and injured but the rest continued with their attempt. They divided into 2 teams, one to halt at the western summit and the other to carry on to the highest peak. Bonnington and Doug Scott made it to the summit, but on the first abseil on the way down Scott fell and broke both legs. With the weather closing in and no hope of rescue he began to crawl down the mountain. 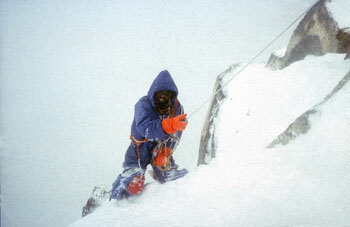 This photograph of doug Scott clinging to a rope as he shuffles along on his knees was taken by Bonnington on the descent. Together they made it to the camp where the other climbers in the team were waiting and shortly after Bonnington fell, broke some ribs and contracted pneumonia. So that was two of them crawling down the mountain. It took them five days to reach base camp and several more until they reached a place where Scott, Bonnington and Braithwaite could get more than basic medical treatment. Luckily all three climbers made a full recovery and went on to climb many more mountains. There are many more tales of badassery in the Karakoram but doug scott’s epic crawl down the Ogre is the one I always think of. 😀 there are enough K mountains to keep me going for a few years. This post stems almost entirely from the fact that last years A to Z challenge I post is the most frequently visited on my blog. It gets several hits a week even now and I know exactly why this is, thanks to wordpresses handy search engine term displayer thingy. It’s because I used the word string “Brad Pitt in a tiny leather mini-skirt”. For some reason people search for that term a LOT. Now I’ve used the term again I expect to get a few hits on this post too so – to make it worth their while coming I’ve added a picture. It’s interesting what people idolise, isn’t it? 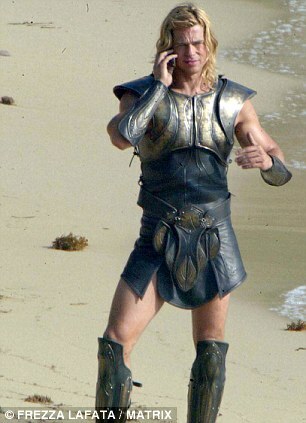 Okay I think he has nice thighs and I love the juxtaposition of the vaguely ancient look and the fact that he’s on a cell phone but the first thing that I notice is that the armour is all wrong. 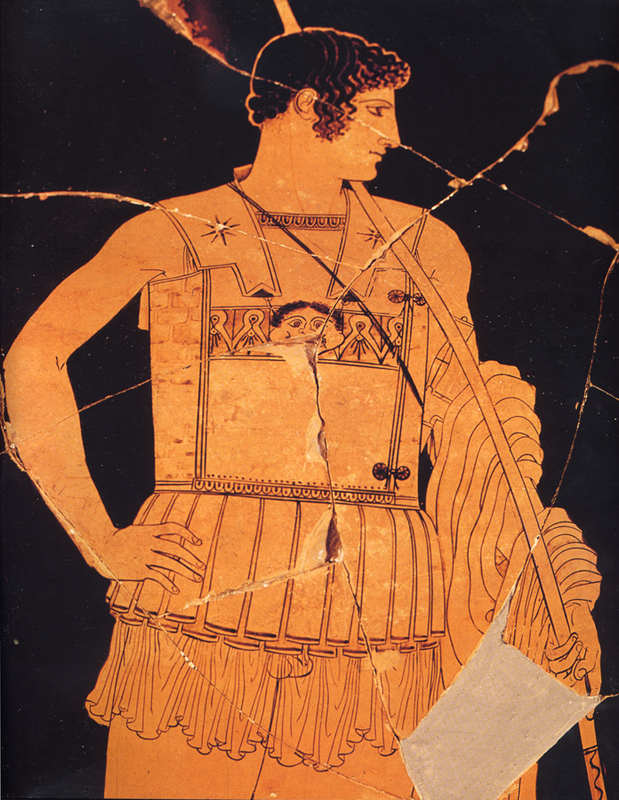 This armour, on the other hand is correct and would not be hard for Hollywood to make. I wonder why they never bother. Layers of linen and fine leather stiffened with animal glue and strapped together with leather thongs and metal eyelets, more strips of the laminated leather/fabric to provide protection to the belly and groin without hampering movement and under it the finest most densely woven material possible to prevent chafing, rather than for modesty’s sake. This painter KNEW his stuff – so did his audience and if he’d painted something that was wrong the audience would have not bought his work. Designers who are working on modern films HAVE to get the clothing right – would you believe a man heading out to a nightclub in frogman’s flippers and a bowler hat? Or the head of a drug cartel driving a Toyota Yaris? But for historicals it’s always the LOOK of the thing that’s important rathe than any kind of accuracy or even comfort. The Lord of the Rings, though very imaginative, escped, that flaw because Peter Jackson got Jonathan Howe and Alan Lee in to do the designs, two men who really know how armour works and how to make it pretty enough for the modern movie going audience while making it possible for the actors to move. I think designers who do their research and try for a bit of practicality and authenticity are worthy of just a little idolatry, don’t you? They say that the surest road to fame for any commander is to have an item of food or clothing named after him. 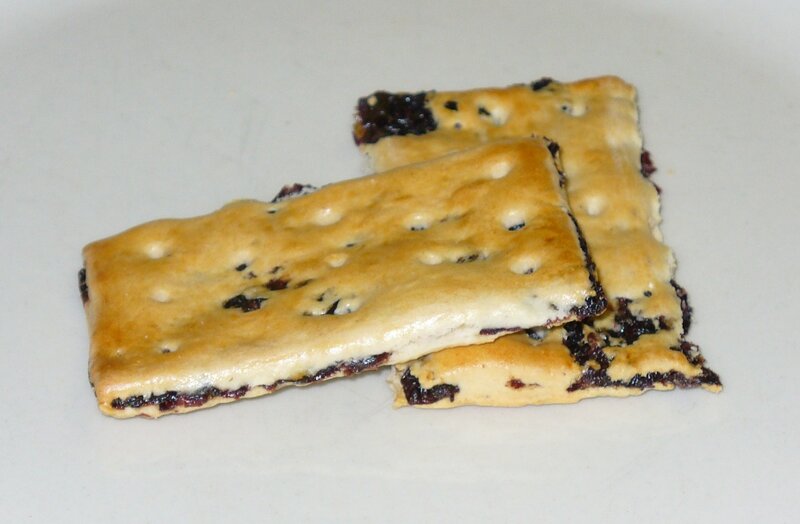 So if you’re wearing your wellington boots and a cardigan while eating a sandwich, how about rounding your snack off with a Garibaldi, known to all in the UK as ‘squashed fly biscuits”. Please note: this is a British blog so biscuits = cookies. What you might well call a biscuit I would call a scone. These biscuits were made in direct response to a visit to the UK from the great revolutionary leader Guiseppe Garibaldi in 1854. As with so much in political history Garibaldi’s life is incredibly complicated. He was born in France from Italian parents and qualified as a sea captain. While in Russia he met an Italian political activist who so inspired him that he signed up to support the Risorgimento – the idea that Italy should be united again, as it once was under the Romans, instead of being separate city states more or less influenced by other European powers. He supported a popular insurrection in the Piedmont that ended so badly that he was sentenced to death – in absentia because he had fled, firstly to North Africa and then to Brazil. Not one to step back from any available fight he joined in the delightfully named Ragamuffin War aided by a marvellous woman called Anita, later Mrs Garibaldi, who taught him how too be a gaucho and fought at his side, and a legion of exiled Italians. They also fought in the Uruguyan Civil War where Garibaldi commanded the fleet, sailing under a black flag to signify their mourning for the oppression of Italy. He and his men all wore red shirts liberated from a textile factory in Montevideo. 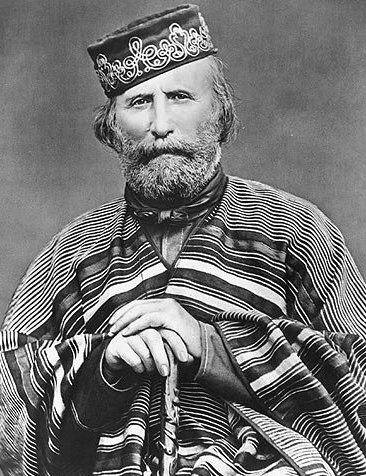 With a new liberal Pope in Rome Garibaldi and 60 of his red shirts returned to Italy in 1848 and fought with personal success on several losing sides in the 1st War for Italian Independence. Eventually he and 250 supporters were driven to San Marino where Anita, who was carrying their 5th child, died. Garibaldi and his supporters withdrew to Tangiers and Garibaldi took ship for America, hoping to raise funds but ending up working in a candle factory. But you can’t keep a good man down and he went back to Italy by working as a sea captain via central America, Australia, China, Manila, Peru and Newcastle in the UK, where he was greeted enthusiastically by the working men of the city, maybe hoping that he’d help them shrug off the yokes of their oppressors. He didn’t but THERE was where they invented the famous biscuit! I could spend another hour of so writing about Garibaldi’s campaigns but we’re supposed to keep these posts short, so I’ll just end by saying that he lived long enough to see Italy at least partially unified, served in their parliament and founded a democratic society espousing universal suffrage, abolition of ecclesiastical property and the emancipation of women. He died in 1882 at the age of 75 having fathered 8 children, written at least 2 novels and two sets of memoirs. April 2nd and so we reach B in the alphabet. Yea, original I know, but I don’t think it’s possible to stress just how important the humble honey bee has been to our various types of civilisations. For a start the social structure of the hive has been held up as a great example of how cooperation can bring plenty to all. Today we tend to look at the inequalities and so reject it but in times past when inequality was Everyman’s lot it was much easier to draw parallels. The people who left the free and easy life of hunter gatherers or nomadic herdsmen for the close proximity of the city needed to see how they could benefit from knowing their place and working hard. Then there were the material benefits that the bee hive provided. The most obvious of these is honey. For centuries honey was the sweetest food item available to mankind, and was cherished accordingly. But it wasn’t just useful for food. Honey has significant anti-bacterial and anti-inflammatory effects and was used as a wound dressing, by he Egyptians as an ingredient of embalming fluid and as a preservative. When Alexander the Great died in Babylon, his body was lowered into a casket filled with honey to preserve it on the trip back to Macedon. It was stolen by Ptolemaeus and taken to Memphis in Egypt instead where the body was properly embalmed and placed on display in a glass coffin, which suggests that the honey did its job well. Honey is being used as a wound dressing today, being particularly useful in the treatment of burns. At a time when human activity was dictated by the hours of daylight, a reliable source of light was prized. In the south olive oil could be used to make lamps but in the cold north we usually had a choice between dips made from animal fat or beeswax candles. The matrix of hexagonal cells made by the bees is very meltable and mouldable and also burns slowly with a clean flame. Candle making was a huge industry right through to the early years of the 20th century because everyone needed candles, from the expensive six feet long candles of pure beeswax used in the great cathedrals and palaces to the little stubs used to light children to bed. The importance of candles passed into idiom with the phrase “it isn’t worth the candle” meaning that something is pointless – it’s not worth lighting a candle to see to do it. Beeswax also had a political application. 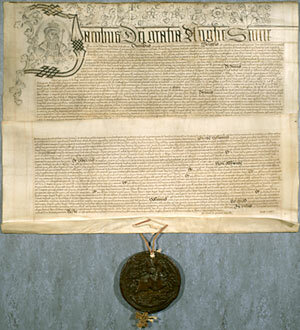 All official documents required a seal of approval to show their legitimacy. In the early medieval period these seals were made from a mixture of beeswax and pine resin. Due to the relatively fragile material these seals were often kept in a specially fitted tin box that would protect the image. As contact improved with the near East the beeswax was replaced with shellac or gum arabic, which gave a harder finish. But high quality beeswax was still used on very special occasions. The honey bee is now sorely afflicted by virus infection. This is more serious than may initially appear. 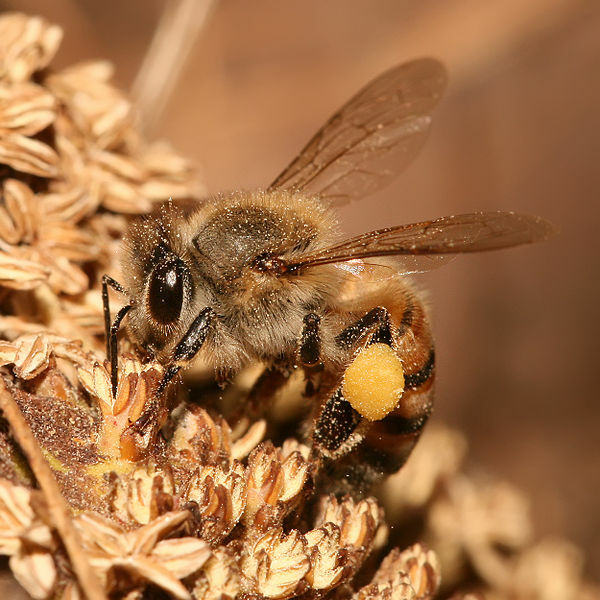 Honey bees are the major pollinators of food crops. Without their busyness crops will ail, especially of fruit and vegetables, and our diet will suffer. Work is being done to preserve the hives but they are in the decline and many wild populations are extinct. Fingers crossed that some treatment will be available soon for the honey bee – worth her weight in gold. So it’s April again and time for another 26 days of fun and frivolity. I didn’t manage all of them last year – I think I dropped 3 – so lets see how I do this year. As last year, just click on the image to the left to be taken to the A-Z website and links to other blogs taking part. Not ‘as you know, Bob’ but the Roman coin that was the standard unit of currency, plural asses. During the Republican era the as was a massive chunk of bronze. It’s telling to note that after about 70 years of carting these things around the Romans had a coinage reform and reduced the weight to a sixth of a Roman pound [approx 56 grams or 2 ounces]. As with all currency, the as had a chequered career. It veered from bronze to pure copper, back to a cheaper bronze mix, and gradually shrank in size. The silver denarius, originally worth ten asses, was revalued as 16 asses in 140 BC as a means of paying for the Punic Wars. Under the Imperium the as was devalued still further. During the rule of Diocletian, who presided over one of the biggest financial crises ever seen in Rome, wages fell and prices soared. Labourers who were paid 400 asses a month had to pay 170 a pound for pork. The ‘doles’ of wheat provided by the government was the only thing that kept many families going. However, the as also contributed to everyone’s social life. We know this because we have contemporary evidence hand written by the people of the time. Barbers and bath houses wrote their tariffs on their walls. So did bars. For instance “You can get a drink here for an as. You can drink better wine for two asses. But for four asses you can drink Falernian” appears on the wall of the bar of Colepius on the Street of Augustus in Pompeii, just around the corner from the brothel. Hedone dicit: Assibus singulis hic bibitur; dupundium si dederis, meliora bibes; quartum assem si dederis, vina Falerna bibes.